I’m not sure about you, but I love a good tunic dress over a pair of denim moment. When styled well, there’s just something about the look that screams “CHIC” without trying too hard. 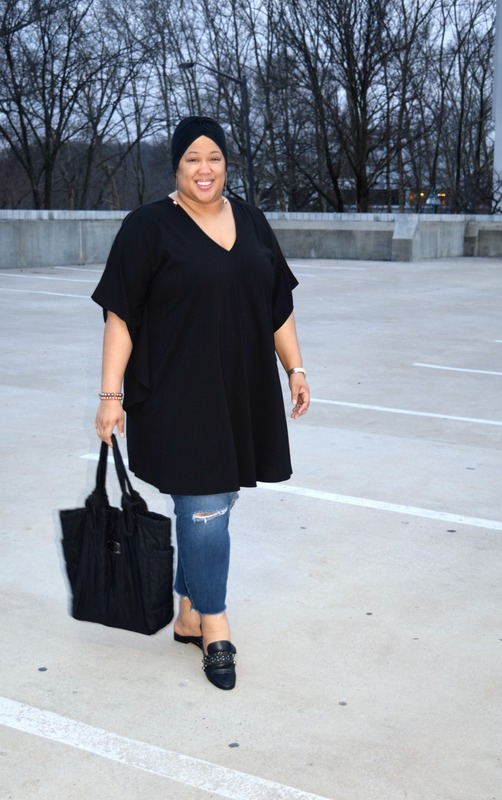 With an active lifestyle and a minimal wardrobe, I also find that paring a tunic dress over a pair of denim (or a pair of leggings) is one of the easiest ways to stretch your wardrobe. I decided to style this look a few weeks back for a weekday date night. I wore the tunic dress earlier that day over a pair of black leggings, but I wanted to do something different for a casual evening out. So, distressed denim it was. I’d like to add that I wore this pair of denim AND the mules (and turban) 2 days earlier while running errands. If that’s not stretching your wardrobe, I don’t know what is! Stretching my wardrobe has become second nature, especially since I’ve adopted a minimal personal style. I love rotating the same top or pair of pants around to come up with different outfits. It’s not rocket science, but I do keep the 3 P’s in mind when it comes to stretching my wardrobe. It helps make the process even more simple. ex. tunic dresses, maxi dresses, cardigans, men’s dress shirts, etc. ex. a tunic dress over denim and just the tunic dress by itself, a cardigan as a layering piece and as a button down shirt, a men’s shirt as a dress and as a layering piece, etc. So tell me, what are some of your tips for stretching a wardrobe? Do you like styling dresses over denim? Let me know! Love this look on you Whitney. Simple yet so put together. You rock the turban! I love dressed up denim, and the little details always make the biggest difference, like your fabulous mules! Thanks, Lydia! They’re so chic and comfy!